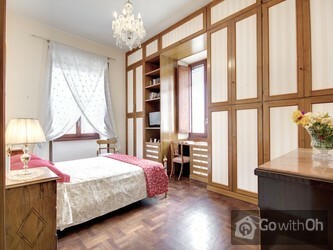 This beautiful 150m2 apartment is elegantly decorated with original parquet flooring throughout and can comfortably sleep up to five people. 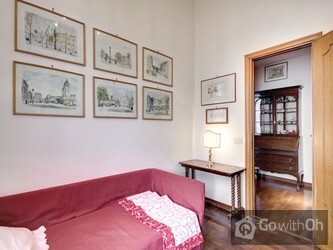 It is located on the fourth floor of a historical building in the beautiful neighbourhood of Prati, just a few minutes walk from the Vatican City and its museums. 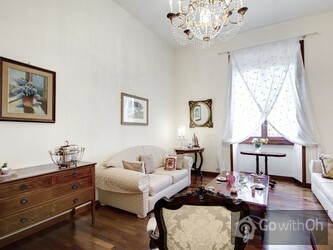 The main entrance opens onto a small hall with an antique chest. 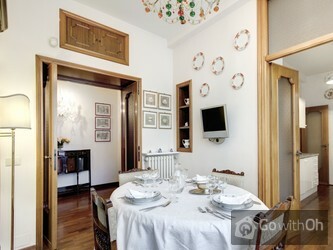 On the right-hand side there is a dining room area with antique furniture, a TV, table and chairs. 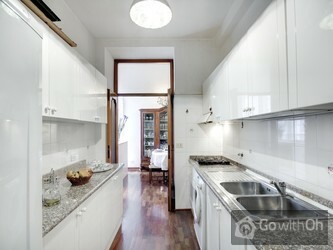 The modern fully-equipped kitchen is slightly separate. Half-way along the passageway linking all the rooms there is an elegant lounge with two comfortable sofas for guests to unwind. 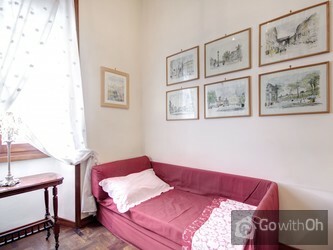 There are three bedrooms  the first very large room has a double bed and TV, the second two single beds (a double on request), and the third smaller room has a single bed. 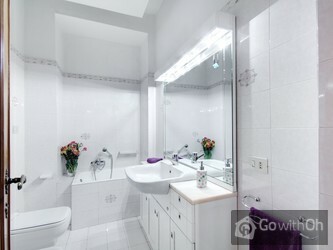 The two bathrooms are well-fitted and in immaculate condition. 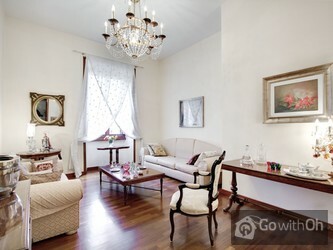 The wonderful lamps and decorative furnishings make the apartment truly unique creating a peaceful ambience for all visitors to feel completely at home. Check in from 14.00 - 20.00 h.
Arrivals between 20.00 - 4.00 h are subject to an additional supplement of 50 . 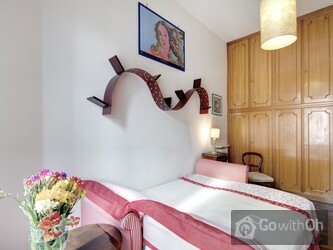 Check out is until 10.00 h.
Appartement bien situé, agréable et bien agencé. 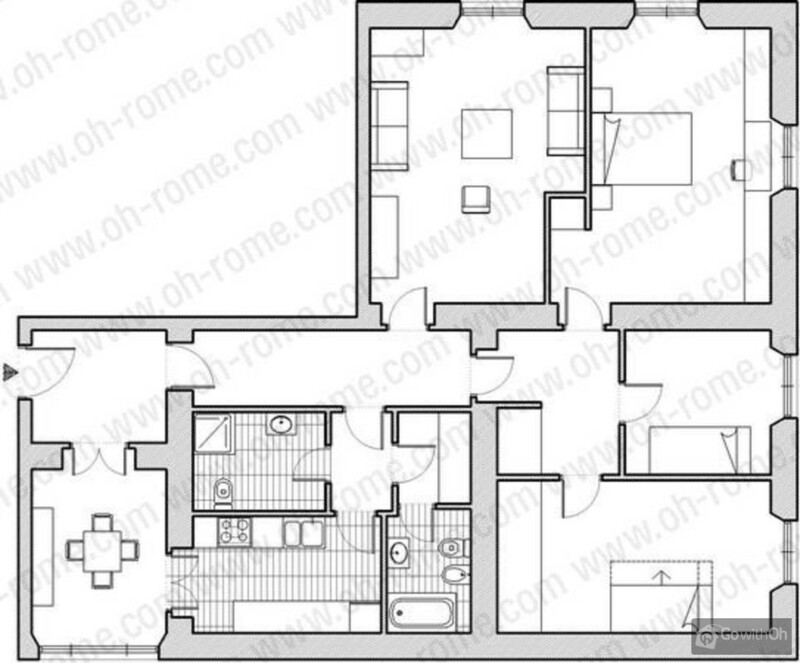 Appartamento con ottimo rapporto qualità/prezzo. 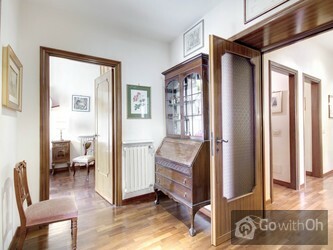 Le foto rappresentano fedelmente l'appartamento. L'unico piccolo disagio, per coloro che hanno bambini piccoli, riguarda l'ampiezza dell'ascensore che non permette di ospitare il passeggino. Consigliato. Mooi ruim appartement, perfecte locatie! Haute qualité, appartement magnifique, très soigné, personne de contact très réactive. Quartier agréable, avec marché couvert en face. Par contre la voisine ne tolère aucun bruit. A savoir. Agreable appartement mais un peu bruyant la nuit.CErtaines casseroles etaient sales.La tele ne proposait que 6 chaines italiennes aucune francaise.A eviter avec des enfants beaucoup trop d objets fragiles. We liked the flat very much. Well-placed for the Vatican and for buses to the Foro Italico for the tennis, but not in the heart of the more touristy areas. For us this meant a lot of walking in preference to grappling with the Roman bus system for journeys not served by the limited metro. We did ...not mind since the weather was good. The facilities in the flat were good with a high standard of furnishing. On the less positive side, just one bathroom had a shower cubicle. The other had a very short bath, shower hose and no curtains. The hot water supply also seemed to us to struggle to serve both rooms at the same time, so we showered in just one. We would have liked an information folder about local shops, the flats fuse box, hot water supply, how to operate the white goods etc. Het was een mooi en ruim appartement, smaakvol ingericht. de badkamers hadden wel een nazicht nodig. De ligging is fantastisch,dichtbij metro en Sint Pieters, en recht tegenover een gezellig overdekt marktje voor verse voeding. Men bood ons "voor een uitzonderlijke prijs van 55 euro" een taxi aan ...die ons zou afhalen aan het vliegveld. We moesten tot buiten het vliegveld lopen om aan de taxi te komen. Er stond vlak bij de uitgang van het vliegveld een hele rij taxi's te wachten die reizigers voor slechts 30 euro naar de stad brachten. Ik zou mijn vrienden aanraden met oh rome te werken, maar zeker op hun hoede te zijn voor jullie "diensten". Appartement spacieux, propre, dans un quartier calme, bien situé. Dommage le lavabo bouché dans une des salles de bains (apparemment déjà signalé par un client précédent, technique de siphon devrait être revue). N'avons pas trouvé le micro-ondes, ni la cafetière... Avons passé un excellent séjour !!! Unser Aufenthalt war super und alles hat gut geklappt. Gerne wieder! Un grand appartement au 4ème étage d'un immeuble "bourgeois" assez cossu et bien situé à deux pas du Vatican. A l'intérieur, un aménagement confortable et complet. Seul petit défaut, un ascenseur très étroit du fait de la configuration des lieux. Dit appartement was goed gelegen, proper, aangenaam ingericht. Een magnetron was welkom geweest. De duidelijkheid van de informatie, de gemakkelijkheid om te registreren en de aangeboden diensten (tot en met de shuttle van en naar de luchthaven). 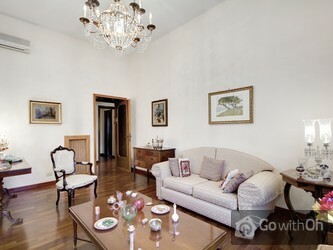 Great apartment in a super location. Due to the number of wifi signals in the apartment complex which cause interference it is suggested that future guests bring a 5m ethernet cable rather than rely on a wifi signal. Gute Lage und schöne Wohnung. Nur in einem Schlafzimmer richtigen Betten. Sonst Couch. Bad-/Kücheneinrichtung ist dürftig und abgenutzt. Vielen Dank für einen schönen Aufenthalt und besonders für die flexible und großzügige Check in/Check out Möglichkeit! 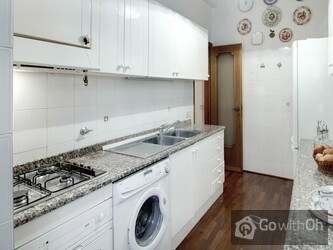 Well located, spacious and clean apartment. Difficulties with the plumbing (hot water was not turned on for us and by day 2 had run out, and the main toilet did not flush properly - we did not use the second macerating toilet for fear of blocking it) and a non-functioning living room air ...conditioning unit were the only problems which impacted on our stay. We felt that the crockery - particularly the glassware - might be improved so that we could use stemmed glasses rather than unmatched tumblers for our celebratory fizz! Beds were comfortable and we received a warm welcome. Alles so, wie wir uns das vorgestellt hatten. Chiara was an excellent host. She spent time with us at check-in and answered all questions about the apartment and the neighborhood. She also gave us great restaurant referrals. And, she booked us taxis to the airport which was very appreciated for an early morning flight. 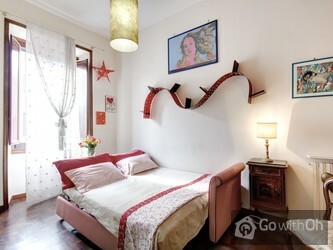 The apartment is ...beautifully appointed, but the beds in the 2nd and 3rd bedrooms are small and not comfortable. Fine for one or two nights. 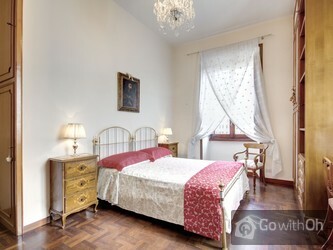 The Master bedroom is perfectly comfortable. Otherwise a perfect stay and we were honored to stay in C's childhood home.